Promotional Logo Multicolor LED Flashing Sunglasses are one best promo item to make night time promotions super attractive. These custom party sunglasses are coming with 12 multi-color LED lights and are capable of bringing a class style to the entire event or celebrations. 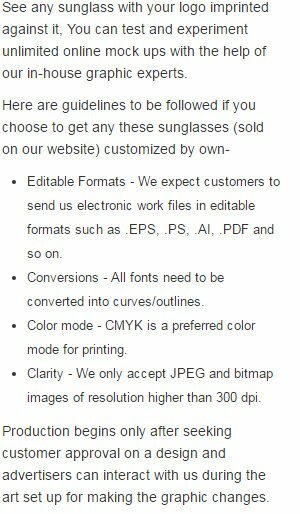 Above all these one size fits most custom sunglasses have a dimension of 6" width and 6" length along with 1.4" x 0.2" imprint area. Order today to grab our free artwork design and free online proofs facilities. Request a quote to know price cuts that you can avail for wholesale Promotional Logo Multicolor LED Flashing Sunglasses.